Milk glass is a beautiful collectible, but it can be pricey. 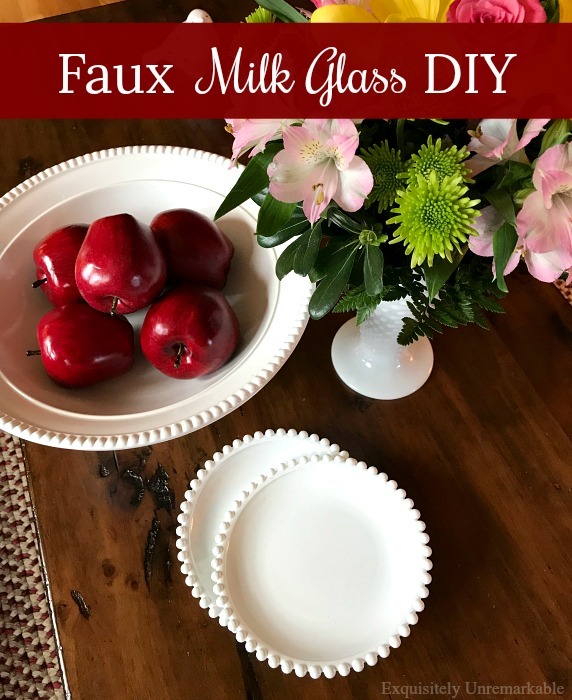 You can create your own faux milk glass DIY pieces with a little bit of paint and a few thrift store finds. Several weeks ago, I shared a rather sad little tale about a couple of thrift store plates and my fruitless efforts to restore them to their original shiny state. It was love at first sight and even in their less than perfect condition, they were too exquisite to leave in the shop. I took them home, knowing that I might not be able to clean them and this might be as good as it gets, but for .99, it was a risk I was willing to take. Unfortunately, despite my very, very thorough attempt to wipe away some of the cloudy film, it would not budge. I was right, this was as good as these babies were ever going to look. Well, not quite. You see, I'm not one to shy away from a crafty challenge and I decided that I had nothing to lose if I tried and failed. Or if my husband tried and failed...since spray paint and my lungs do not play nicely together. I had seen a lot of those DIY milk glass posts go by on Pinterest over the years and I thought, why not. We already had a can of white paint in the garage, so as soon as the temperature climbed into the safe zone, he sprayed. Of course, it took several weekends, because after one coat was applied, it started to snow....and it continued to snow. Then when we were able to sneak in another coat or the other side, it snowed again. And then again. Mother Nature is obviously not a fan of quick and easy DIY. As far as the technicals go, there really aren't any. He applied two coats on each side and that was that. I wasn't very particular about using "the right paint" for a milk glass look. We used what we had, glossy white spray paint. I'm not trying to convince anyone that they're real milk glass, so there was no need to spend the dough or the time buying new. I have to say, I am thrilled with the outcome. The plates are outstanding and honestly, my untrained eye cannot tell the difference between these and my real milk glass. Perfect. We won't be eating off of them, because the paint is not made for that, but they make fabulous display pieces. You probably spied a pair of frosted plates in the photo above, too. I have a little project in process and I'm not quite done with it. Soon. Oh and here's a fun little footnote. I originally purchased five plates. We painted four of them and left the one I had been trying to clean untouched, because I was still determined to try every single last trick in the book to clear up that cloud. I had uncovered a glimmer of clear glass and I was beginning to get excited when disaster...or more likely Murphy' Law...struck. So close. Well, that was the end of that plan. That's ok, no use crying over spilt milk. Especially when you can fake milk glass. Are you a crafty faker? How about some more crafty faking? Hand Painted Wooden Sign? Umm...nope. Reupholstered Chair? Not quite...there's a secret! I wouldn't have seen the difference if you hadn't told me Kim. They look perfect! 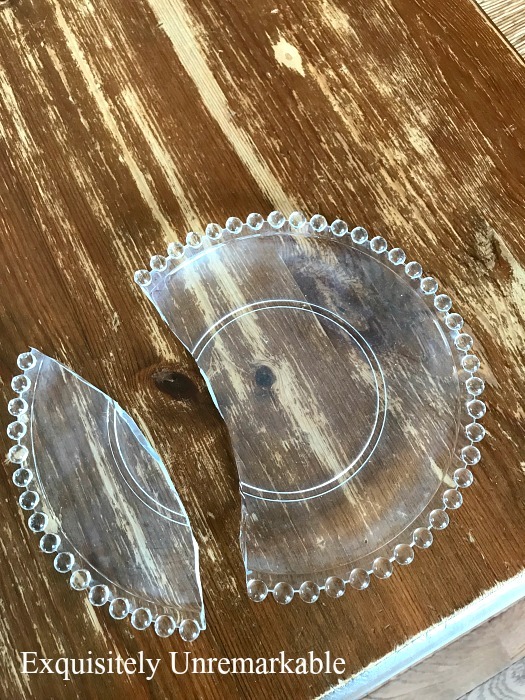 Did you try vinegar on the plate that broke? That's an old trick...I'm sure you did. Thanks Florence! I did try vinegar...I tried EVERYTHING. It was so disappointing, because they really were beautiful and we could've eaten off them. That's ok, though, they are very pretty now and I will look at them and love them anyway! those little plates look pleased as punch with themselves! Cute, Tammy J! They really do have personality. Love the faux milk glass look. Very crafty. So glad you did not give up. They are beautiful display pieces now. Happy St Pattys Day. Thanks Kris! They were just too pretty to toss or leave all scratched up. I am really happy with the look and now that I have new white dishes (well, sort of...that's a post for another day!) they look even better! I think they look so sweet and really do look like milk glass! Thanks Carol! I just couldn't toss them. Too sweet to let them go...hugs to you! I'm wondering if you tried using an SOS pad on them? It's my go-to method of cleaning transparent glass. 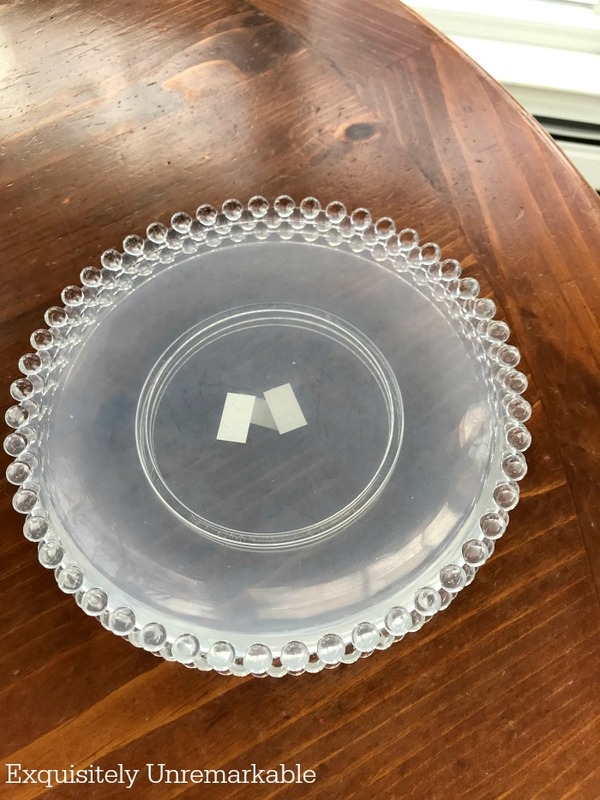 I have a very old clear glass casserole dish (not Pyrex) that is scratched (etched?) beyond belief. I didn't scratch it; I don't even know how the bowl ended up in my cabinet in the first place. Anyway, it's the sole example I have of glass being scratch-able. SOS pads don't scratch even cheapie glass dishes from the Dollar Store. I guess there's no way to find out if SOS would have worked now that the test plate has been broken and recycled. Besides, the pom-pom rims would have been excruciatingly time-consuming to clean without breaking... Your faux milk glass versions are gorgeous--especially when they're stacked with such a diverse variety of other rim styles. I'm in charge of the church rummage room at St. John's United Methodist Church here in Tucson. We have a rummage sale once a month. Church rummage rooms have a terrible reputation when it comes to how poorly their rummage is displayed and how clean everything from clothing to kitchen items are *not*. I absolutely refuse to sell donated items that are dirty, dingy, broken, or in substandard, non-working condition. Almost nothing that goes into the kitchen gets by me without being washed. SOS pads are great for getting off water spots or hard-water deposits. If you have dingy glassware, you'll be super pleased with the results an SOS pad will give you. I don't know about Brillo and I would *never* try Chore Boy with its big coils of metal. I never have much luck with chemicals that are supposed to get the job done. Yes, water stains can be very hard to get off and sometimes require a lot of heavy-duty scrubbing and getting into very small spaces/corners, but please be cautious. I guess I'm bragging about how experienced I am at cleaning kitchenware of all kinds--transparent glassware especially. I'm recommending SOS pads since I have no experience using Brillo. Hi Cindy! Sounds like I should've sent my dishes to you! I actually went back to the thrift store after your comment to see if they had more of the plates left. I didn't buy them all that day, but some other smart person grabbed them. I am on the hunt now and I also bought a box of SOS in case I find other glassware. I am on the hunt now! And btw, you would be a treasure in my neck of the woods...you should see what's on display at rummage sales in our church and the local thrift stores. What a mess! Thanks again for your super tips! I really hope I have the chance to try them out and I know they will help others looking for a solution!! What a great idea! They turned out wonderful! Thanks so much, Mari! I am very happy with my Plan B! What a great fix. 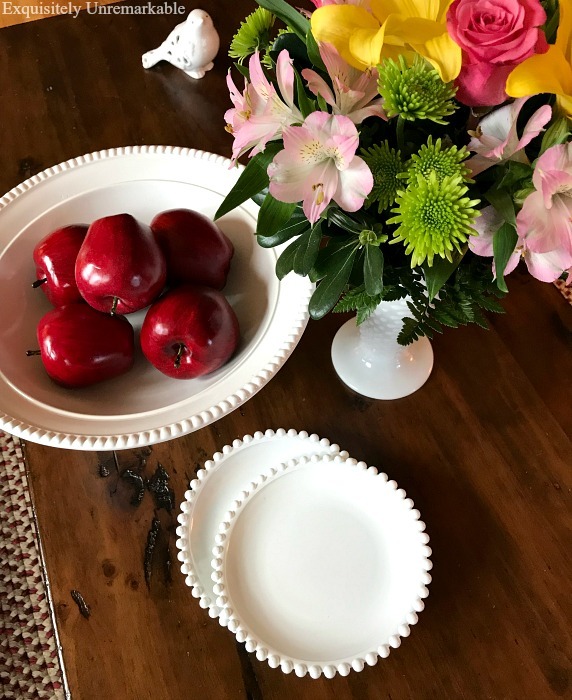 My daughter is a milk glass fan, especially hobnail milk glass and these with the balls on the rim are reminiscent and blend right in with your hobnail vase. They look great. So clever. I love mild glass, Lorri. I am a recent fan. My mom wasn't a collector, but my sister is now and I think hobnail is my favorite. That vase was a few bucks at the thrift store and I could not leave it behind. I adore it and I do agree, the balls are very reminiscent of the style! Of course, it's a bummer that we can't eat on them, but at least they're pretty to look at...and thanks!! Crafty Milk Glass for sure! Thanks Lynne! I had really hoped I could get the dishes clean, but this will do. You amazing me. Great work! And thank you for the post with grass .. I am jealous. Still snow all around us. Thanks Carla! They were too pretty to give up on...I had to do something. Oh and that grass post is deceiving. We still have snow, too. I cropped the picture so you couldn't see it!! I think it flurried just about every day last week and we are expecting another big snow dump Tuesday and Wednesday this week. Yay spring...in like a lion and out like one, too. Wow! I can't believe the difference! I may have to try this. Its amazing what a little bit of paint did for those plates! It really brings out the unique balled edging. Totally worth the effort of snatching craft time during Mother Nature's fits. Thanks Audra! Paint really is the great transformer isn't it? I am looking forward to decorating with them. Thanks so much, Teri! I was happy to be able to salvage these plates in such a pretty way! Hope you're week is fabulous! Love your solution! I'm telling ya...spray paint fixes everything. :) I really like your new dishes too! And if you ever figure out how to remove the film on clear glass, let me know. It might just work on my shower door too. Lol! Spray paint is a true magician, isn't it? Inside, outside...it's the great transformer! And I would definitely try some of the tricks I used, people swear by them. I just think my plates were truly damaged... good luck! I think they look great, as do those fabulous roses. I love how you present your posts, they look good and are really interesting, thank you. Thanks Jan! Bet they'd look great next to some of your fabulous meals! Spray paint to the rescue!! Thanks Jane!! You're absolutely right, Michelle! There is something to be said for being a rule follower!! Ha! Milk Glass is so beautiful and this is such a fun way to recreate it! I will have to give it a go one day soon. Thanks so much! 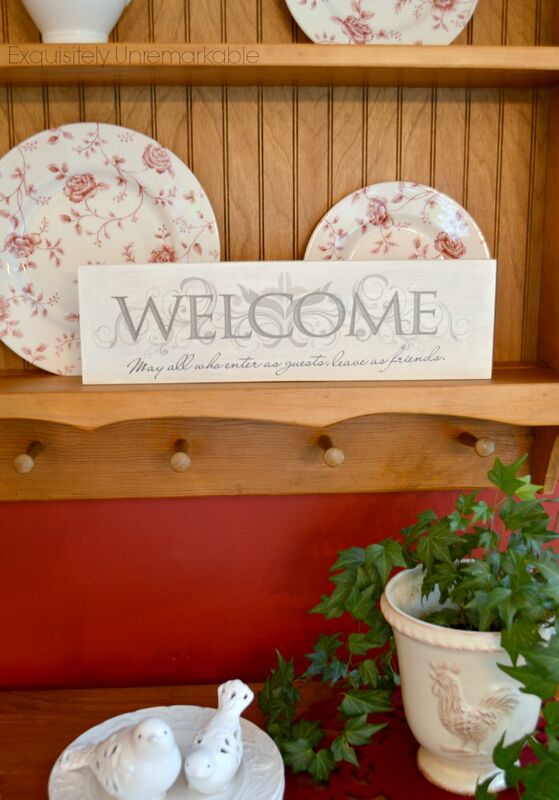 It was a fun project and a happy way to save those plates! I love what you have done here Kim. This is a brilliant solution. A good challenge brings out the real woman in us and your my friend succeeded fabulously! 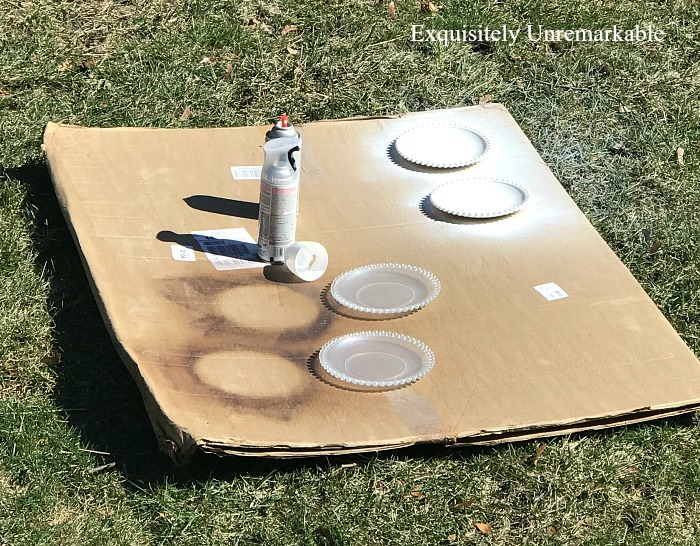 Hey Kim, that was a great idea to spray paint the plates white. They came out great and will look nice for display. I am glad that you were able to come up with a solution to fix the plates and be able to use them. Stay warm and enjoy the rest of the week. Thanks Julie! It was the only way I could think to save them. They were just too pretty to toss!! Enjoy the week! Thanks Marilyn! There has been a lot of snow! Not quite the same amounts that you have been hit with, but we deal with it much less well around here. The kids have missed a bunch of school and they have taken away vacation days which is a bummer. The good news is that as spring approaches, it melts much faster!! Ha!! Just wanted to let you know that your beautiful plates are designer "Candlewick" (about $20 each)and the film you tried to scrub off is actually how the plates are made. Some were made clear, and some with a slight frost to them. Thanks Bonnie. They really are pretty plates and now I am on the hunt for more. The plates I had were oddly and unevenly coated. There were spots on the plates that were totally clear which is what made me hope that it would wash away. Perhaps they were frosted and it wore off in spots. Thanks for the information, I love learning about these things! Love how they look painted! We had a whole box of Candlewick dishes when we hosted those yard sales for my friends late Aunt. Thanks for sharing with SYC. Thanks Jann. I love the Candlewick pattern. I just couldn't leave them a mess. And this weekend on a mini vacation, I saw some gorgeous accessories, bowls, platters, etc. in an antique shop, but wowzers they were pricey!! Well, they look like real milk glass. I love the dotted edge. Thanks for sharing these at Keep In Touch. They really do look authentic! 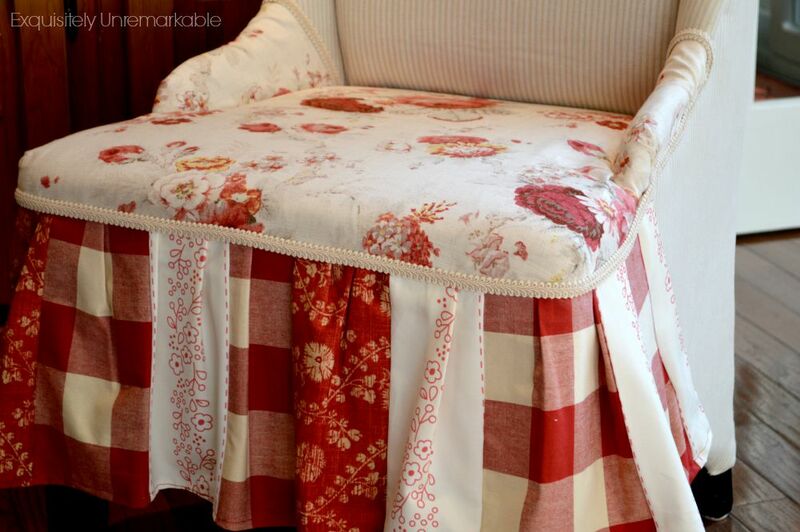 Thanks for sharing your clever idea at Vintage Charm--pinned! I think those dishes were called Candlewick. And toothpaste, plain white toothpaste is really good for removing scratches too. 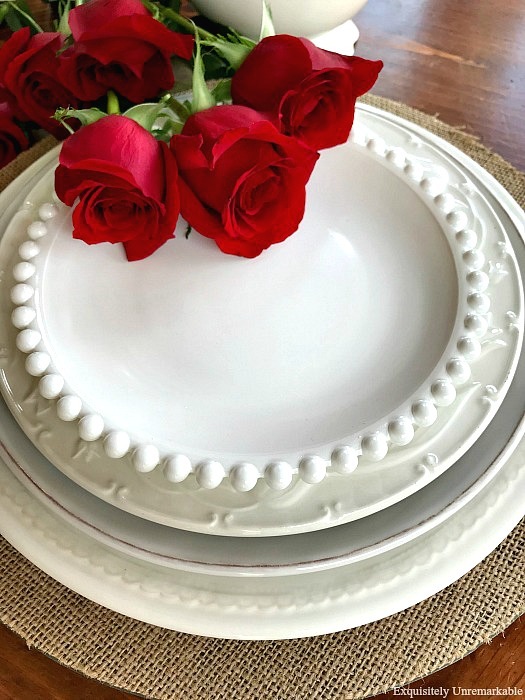 I would also suggest you could use those plates for serving, cookies...candy or things like that...just use a paper doily so the food doesn't come in contact with the paint! Great idea tho! I lover your doily idea! I have been looking at them for weeks wondering about that. I am going to do just that and show them off with some treats on a doily! Thank you for the hint! !